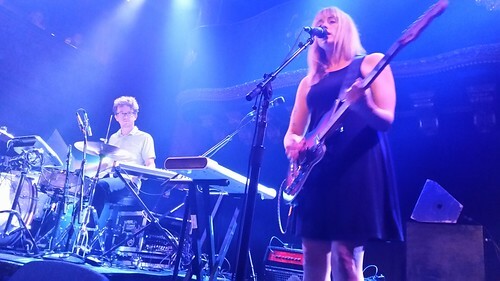 Baltimore’s Jenn Wasner and Andy Stack (aka Wye Oak) came to town last night and for so many reasons it was a show not to be missed. I hadn’t seen them since my NYC days (why, I still do not know) and they did not disappoint. It was fairly amusing to see Jenn come out in a tank top, bent over plugging everything in and setting herself up for the show. With no crew, the band is a minimalist act in nearly every way possible. One of the things I most appreciated (and it seems like perhaps I hadn’t seen/heard this in far too long), was a band who clearly was doing this because they loved it more than life itself. Before playing ‘Civilian‘, and having a very out of tune guitar, she mentioned they were too poor to afford a guitar-tech. She went on to talk about how thankful she was people still came to see them play and people still paid for shows. She mentioned how this was an artist’s life and how if it was not for the fans coming out, they clearly would not still be doing this. Thankfully, Wye Oak still has a big enough fan basis. While the GAMH was not sold out, it was still quite full and even with quite expensive tshirts, there was still a line after the show ended for shirts and records and other things. Probably the best $25 I spent, assuming the band took 100% of profits. I hadn’t been in a mood to write about shows for a long time. Sure, there’s been good shows (I’ll do a rundown in another post), but none were leaving me with this blissful feeling. Perhaps it comes with humility and a band that does everything for themselves. When I left the show, I felt like I had just seen something even better than expected. The band opened with “If You Should See“, a very dreamy-pop song that brings back the haunting vocals of Harriet Wheeler of The Sundays. The song is off their new album Tween (a new album of sorts “mini-album” of out-takes between Civilian and Shriek). Their new album is not quite as guitar heavy as their other album but is bringing in some synths to the mix giving it a more light, dreamy feel. The band’s next song “Better (for Esther)” also off of Tween is a great mix of the old meets the new. 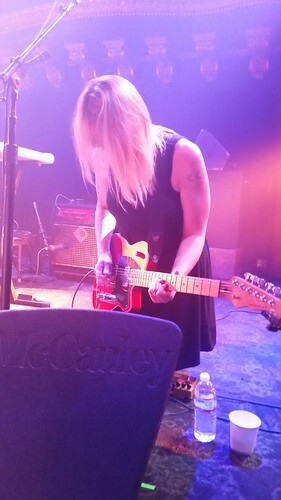 When the guitar comes into action it gives the band a nice full song plus shows off how great Jenn is on the guitar. She loses herself in the guitar, just shredding away, head moving to the music. It’s moments like these that the crowd really got into the performance. Wye Oak played a good mix of their work from the newer to the older. I was never a huge fan of their last album, Shriek, which was more synth-pop. It drifted almost too far from what I had liked about them, but “The Tower” did sound quite great live. This new album has grown on me quite a lot. Dance-y dream-pop songs had never sounded better and Jenn’s vocals were just soaringly beautiful on “Watching the Waiting”. Lyrics that so perfectly rang true, “And there is nowhere I need to go. And there is nothing left to do. And I am sitting watching myself. Watching you. Watching the waiting”. It was really great to hear their older songs which are just so full and loud with Jenn tearing it up on the guitar. She is so powerful on “Hot As Day” and “Civilian” and gets lost in the music along with the crowd. It’s a lot of noise for just a two-some. Her vocals on these songs have always reminded me of Sharon Van Etten, sultry, powerful and full. “Civilian” had never sounded better, the guitars were so full and loud, the words just pouring out of her, it was pure raw, emotion. It was an encore so that actually felt so worth it. Jenn and Andy both came across as so appreciative. Plus, it wasn’t just the hits that they came back to. “For Prayer” was great to hear, a much earlier track that fans really appreciated. Ending the set with “Holy Holy” was quite awesome with Jenn shredding the guitar and the crowd energized and dancing along. It was a perfect way to cap off the performance. Tushka opened the set. Another duo, comprised of two brothers from North Carolina. Phil was in the band Bowerbirds. A mostly electronic R&B pop was a fun opener. The brothers seemed to have a lot of fun on stage and were really getting into the music. Would definitely check them out again if I see their name around. This entry was posted on July 17, 2016 at 12:27 pm	and is filed under Uncategorized. Tagged: Andy Stack, Baltimore, concert, dream-pop, girls who play guitars, Great American Music Hall, guitars, indie-folk, indie-pop, Jenn Wasner, live, music, noise-rock, North Carolina, San Francisco, Tushka, two-some, Wye Oak. You can follow any responses to this entry through the RSS 2.0 feed. You can leave a response, or trackback from your own site.